there's no other way of describing the great man, but the mighty dave-t is a hardy individual. though he may not venture out on a sunday morning when inclement weather pervades, as he is in favour of constantly pointing out, he's a pensioner; there's no need. while we're all slaving away over a hot imac on a schoolday, he's out traversing the highways and byeways with flair and devilment. and the acute observer will have already taken note of his proclivity for wearing short-fingered track mitts even in the depths of winter. though his weather-related absence on a sunday morning raises the temptation to point him in the direction of rule #5, this would be a beginner's mistake, for there are few of hardier constitution, other than perhaps johan museeuw and bernard hinault. and i'm convinced that, if you were to search websters dictionary under badass, the definition would contain both mighty and dave. 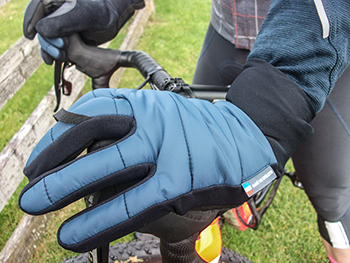 the end result of this knowledge is to accept that no amount of well-meaning text from the fine fellows and fellowesses at café du cycliste is likely to attract his attention towards their mid-season wind-resistant gloves. and this despite the empirical knowledge that islay has quite literally, lashings of wind just waiting to be fended off by the attractive softshell panels on the back. for those of us less acquainted with stoicism and hardiness, however, they look to be a far more attractive proposition. while the phrase 'mid-season' might be open to interpretation, depending on the time of year and the hemisphere in which one resides, in this particular case the apellation straddles both autumn and winter. if you live in the hebrides, it may also contain just a soupcon of spring. if it were simply the blue softshell back panel (also available in camel, red and black) between you and the elements, questions would undoubtedly be asked in the house. but thankfully, between inner and outer surfaces is a fleece-backed liner, keeping those flexible digits as toasty as a very toasty thing. and, truth be told, they more than live up to their purported reputation. that wind of which i made previous mention has been given every opportunity to break that fleece/softshell barrier, all to no avail, while the reinforced and minimally padded leather palms offered a comfortable grip on the bars. if i have a criticism, it might relate to the sizing; the samples sent (at my request) were size large, offering a good fit on my hands and in particular, the thumbs, yet the fingers were just a smidgeon too long. in mitigation, this extra length was well short of iniquitous, but i think worth pointing out nonetheless. they are distinctly not waterproof, soaking up any precipitation in very short order, but then café du cycliste make no claims in this direction. 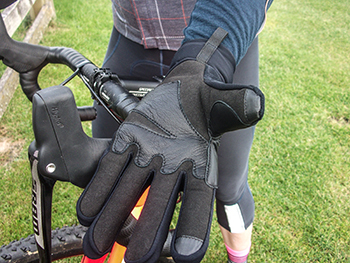 they are pleasantly lightweight and feature a loop on the back of the middle finger to enable easier removal and the long, lycra cuffs bear a second tab to ease getting them on in the first place. 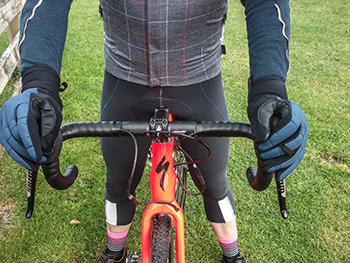 if, like me, you do not possess the hardy constitution of the mighty dave, a pair of mid-season gloves could well be the very items needed to insouciantly ride alongside in the sunday peloton on a cold mid-season day. and on such days, when the atlantic wind encourages a runny nose, there's a soft coating on the thumbs with which to salve your stature as one of life's more conscientious individuals.